The financial crisis of 2008 had left the economies of the world reeling in its wake. The financial crisis of 2008 had left the economies of the world reeling in its wake. It started out in the US and then slowly percolated into the financial sectors of developed and developing nations. Given the level of influence the US economy has on the rest of the world, the debilitating effects were more or less expected. The unexpected aspect of the crisis was the nature of the devastation it would cause. Panic set in, the share market took a nosedive, big corporations were either being bailed out or declared insolvent and unemployment became rampant. So what caused this utter functional failure of the financial system? The subprime mortgage crisis was one of the first indicator as well as a trigger for the financial downfall which hit the world economy in the final quarter of the last decade. The base cause of the economic instability can be traced back to the bursting of the housing bubble. The long term trend of appreciating real estate housing prices coupled with easy lending terms encouraged borrowers to think that they could take on heavy mortgages and quickly refinance them for more favorable rates. As soon as the interest rates began to increase along with a steady but moderate dip in housing prices, refinancing these mortgages became very difficult. The number of foreclosure cases increased by leaps and bounds because homeowners failed to make their mortgage payments as their easy initial payment terms expired. The foreclosure epidemic initiated by the subprime lending practices had ebbed away the financial strength of banking institutions and had drained consumers of their wealth. The housing and credit markets had based their business purely on predatory lending practices and speculation during the economic boom. The US economy, prior to the onset of the crisis, was being bolstered by foreign capital flowing into the system (Foreign Direct Investment or FDI) from developing countries in Asia and the Middle-East. Combined with the low interest prevalent in the US before the crisis came into effect, credit conditions eased up therefore adding to the credit and housing bubble. Credit lines became easily obtainable and consumers, knowingly or unknowingly, took on mounting debts. The economic boom and the financial innovations of the US economy attracted foreign investors. As such, foreign institutional investors (FIIs) with vested interest in the mortgage-backed securities (MBS) and credit markets reported significant losses as soon as housing prices began to decline. The effects of the crisis began to creep into other sectors of the economy as consumers started to default on different lines of credit. Shadow banking systems also added to the frailty of the US economy. The importance of such financial institutions was not recognized by government regulatory bodies who failed to control their activities. The importance of these financial institutions paralleled that of depository banks in providing credit to the US economy. Shadow banks also hid their financial activities from investors and regulators by masking their functions through off-balance sheet derivatives and securitizations. These shadow banks along with certain other regulated banks had acquired a significant debt load while engaging in unsecured or high risk lending practices like subprime mortgages and MBSs. The subsequent effect of the total debt load being borne by the economy led to federal bailout of several key financial institutions. By the end of 2008 some of the big names in investment banking and insurance had either declared bankruptcy or had agreed to be acquired by other financial institutions. The fallout of the subprime lending crisis had serious long time ramifications for the US economy as well as the world economy as a whole. In October 2007, before the crisis had begun, the US stock market had peaked with the Dow Jones index exceeding 14,000 points. 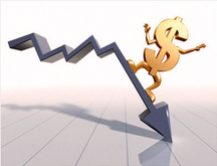 A steady decline in stock prices followed the index peak which accelerated into a nose dive by October 2008. By March of 2009, the Dow Jones average flatlined at 6,600 points. The Dow's drop of 50% over a period of 17 months is akin to the 89% drop over 33 months during the Great Depression of 1929. Over 100 lenders dealing exclusively in mortgage loans went bankrupt between 2007 and 2008. The combined losses of these financial institutions stood at $1 trillion in toxic assets and bad loans with no debt relief in site. Companies such as Lehman Brothers, AIG, Citigroup, Freddie Mac, JP Morgan Chase and Merrill Lynch were either subject to fire-sale, acquisition or federal takeover. The crisis had a marked effect on the economic as well as social aspects of the country. The financial crisis caused the country's economic output to decrease by 6% in a single quarter (4th quarter of 2008) and unemployment rate increased by 10.1% by 2009. Consumption of non-durable goods had also decreased by 6.4%. Companies downsized a total of 63,000 employees in February of 2008, 156,000 in October and 533,000 in November of the same year. From December 2007 till the end of 2009, it has been estimated that 5.1 million citizens had lost there jobs. Other than rising prices and falling rates of consumption, the poor condition of the economy also contributed towards the increase in criminal activities. Cases of burglary and robbery had increased by 32% and 39% respectively, reports of vehicle theft went up by 17%, fraudulent insurance claims amounted to $980 million, 500,000 people had been victims of identity theft, domestic violence rates went up by 25% while prostitution and illegal drug use related cases saw an increase of almost 43%. The only bit of good news is that the rate of violent crimes had gone down by 21% during the financial crisis years. The interlinked nature of wealth, consumption and business investment along with government spending represents the economic engine. The period between June 2007 and November 2008 saw the loss of more than a quarter of the nation's net worth. Housing prices and home equity, stock prices, futures, savings and investment assets - each and every sector of the finance market bore major damage. The US Federal Reserve had no other option but to inject $6.8 trillion into the economy in an attempt to revive it. The government has committed to invest another $7.1 trillion for the same purpose. The socio-economic condition of the nation is set to improve through federal aid and responsible economic practices on part of the big corporations.